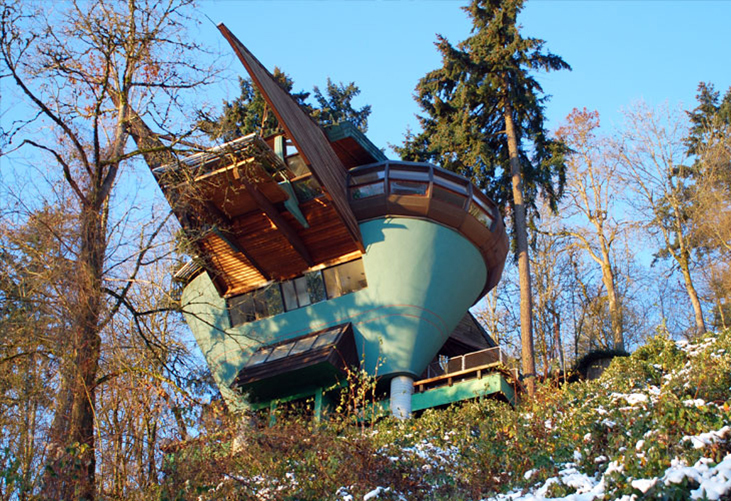 When Oshatz bought the property upon which he would build his home and studio, the site was considered to be unbuildable. 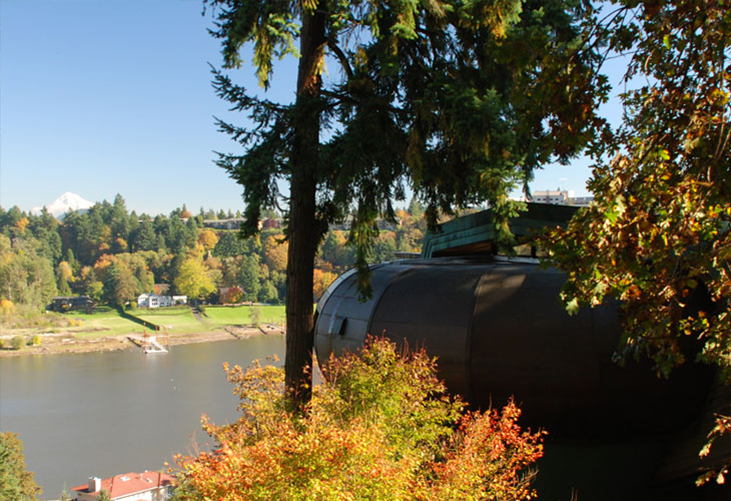 It is located on a slope that drops into the Willamette River and is far too steep for conventional building techniques. From high on the site, a commanding view over the city of Portland is dominated by snow capped Mt Hood. 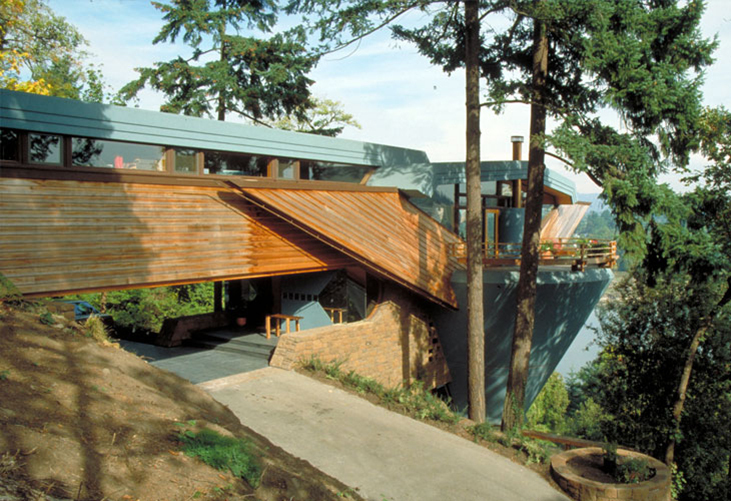 To make the most of the view of Mt Hood, Oshatz orientated the building to face directly toward it, and developed a hierarchy of spaces. The main living spaces are held high in the air to take advantage of the views, the children’s bedrooms, where the view was less of a priority, are located below, and the studio and children’s playroom, where the view is unimportant, are located at the bottom of the house. The size of the floor plan required to accommodate the functions of the floors diminishes as you descend from the main living level, giving the building its conical shape. The master bedroom is raised a meter and a half above the lounge room to allow a view from the bed over the living room, and out to the mountain beyond. The kitchen occupies a spot at the top of the stucco cone shape and is clad in a copper tube-like form, which is punctured to allow for windows to stretch along the back of a built in seat. 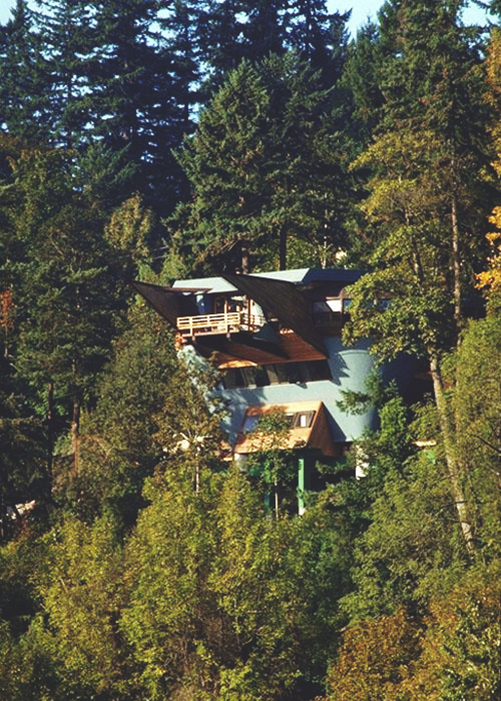 The main living space extends out into the canopy of the surrounding Douglas Fir trees, and is an ideal perch from which to watch Canadian geese, red-tailed hawks and bald eagles as the glide by. The Elk Rock Residence uses a stucco finish, white sheetrock, and a Douglas Fir tongue and groove ceiling as its primary material palette. These materials are carried through the glazing to dissolve the barriers between inside and out. The roofs have an almost canopy feel to them and are separated from other elements by glass. This gives the impression of being in a space that is defined by its elements and not by its surfaces, and allows the external space to flow through the building. A thick plush carpet is laid over a concrete slab, which is heated using a geothermal heat pump. The radiant floor heating is designed to keep the feet warm and the head cool to create a comfortable environment for the occupants. The slate tiles that are used in the car port are carried through, uninterrupted to the inside.